Learning the meditations, methods & sadhanas for Healing Chod rituals. Understanding the practice of Ransom, Torma and Elemental Healing. Comprehending the ethics and responsibilities of healing rituals. The MaChik cycle contains a series of practices for clearing of obstacles, demonic influences, repaying massive karmic debts and correcting imbalances of the five elements of body and mind. These Healing Chod methods can be used in ones daily practice or in a group or solo retreat. Once these skills are acquired, they are tremendously effective in helping alleviate suffering and illness in others. Advanced Chodpas effect remarkable cures with repeated series of these rituals over time. These practices have not been previously translated or openly taught in the West. The ultimate goal of Vajrayana, the Tibetan Diamond Path, is none other than enlightenment, the realization of our full human potential. But as part of the Mahayana, it goes beyond personal accomplishment, seeking to relieve all beings from confusion and suffering. These two benefits, for oneself and others, are accomplished through the two meanings, Wisdom and Skillful Means (Tib: Sherab and Tab). Wisdom and Means relate to the polarity of ultimate and relative reality, that strange paradox wherein the diverse forms and phenomena of the material world co-exists alongside the ultimate, open and luminous matrix from which they arise! Wisdom is the direct experience and dwelling in that ultimate state. Skillful Means are the ways in which we act in this world to relieve the suffering of those who cannot see beyond the relative.The goal is to engender Wisdom in others, while working to alleviate the infinite ways in which beings experience pain and limitation. Thus Tibetan spirituality, particularly in the form of Healing Chod, contains many practical methods for helping us in our daily struggles. Naturally, one of the most important ways of benefiting others and ourselves is through the art of healing. In the Tibetan culture, the wandering practitioner of Chod was called upon regularly to minster to all manner of sickness of body and mind. Further, the rigorous life of the the nomadic yogi or yogini required remarkable fortitude and vital strength. Thus, since the time of MaChik, the field of Chod developed a rich tradition of healing chod practices and rituals. These vary in duration, style, melody and performance. But they all share the same fundamental understandings about the nature of sickness and health, and have a similar approach to clearing the deeper causes of illness, while augmenting the forces that bring about health. The causes of illness are biological, hereditary, environmental, toxicological, and so on. But they are also deeply psychological, karmic and related to negative energies, toxic influences and entities. It is these last areas that Chod addresses, and which are utterly ignored by materialistic, reductionist science. Such forces are very real and very potent, playing a powerful, yet hidden role in the lives of people. Chod is the ultimate method for clearing these factors, through relentless generosity, cleansing spiritual energies, and the power of pure enlightened consciousness. This basic and popular Healing Chod ritual utilizes various ransom substances to clear the karmic patterns and obscurations of those needing healing. Dough balls are pressed to the body to pick up our DNA and energetic signature. Then these torma, wash water, blood (tea or colored water) and meat form the basis of the repeated offerings. This very important healing chod ritual makes specific feast offerings to clear the karmic imprints and stains of the Earth, Water, Fire and Air Elements. All sickness and all suffering arise within these elements. At the same time, each element within the participants body is purified and renewed. An ideal practice for self and others. Feasts are offered to the mandala of Troma in the six directions (including above and below). Special tormas and martor are offering in each of these directions, simultaneously clearing our defilements in relation to the five Buddha families, five elements and five poisons. In this ritual, special feasts are offered to the nine classes of demons, such as the sinmo, nagas, elementals and so on. This is used to calm the specific effects of each of these negative influences on our health, home and inner happiness. There are no torma offerings in this practice, but a special hand mudra offering. DVD with all the torma offering sections of the first three of the healing practices, so that students can learn the accurate and effective method of offering these ritual substances. Additionally, a video of the full torma making process for all rituals, and the hand mudras of the Feast of Nine Demons, is part of the training packet. An extended set of 8 fully edited and titled DVDs is available, that offers a visual dimension to all the teachings and full practices. Students: Module 5 is open to all students who have taken Module 1 or beyond. Though this is “out of sequence,” we are offering Module 5 because of the urgency of creating skilled healing Chod practitioners. Don’t worry…You DO NOT have to fill out an additional application, since I already know who you are! Chod Practitioners: For the same reason, module 5 is open to non-students of the School. To apply, please DOWNLAOD the Application Form, fill ti out and email it back. Since Chod training varies tremendously, further interview (by email, phone or Skype) may be needed to make sure practitioners have the requisite knowledge and skill set to attend Module 5. These are extremely powerful and formerly secret practices. While registration is open, if an individual is not suitable for this kind of practice, through problems with maturity, motivation, inflation, malicious intent, serious power issues, and so on, it is not appropriate that they undergo this training. The assessment of suitability lies at the sole discretion of the school’s director. a DVD of the all the torma sections of the rituals. Checks can be sent to “Tibetan Cho” may be sent to: School of Chod, 321 N Pass Ave, Suite 151, Burbank, CA 91505, USA. Or you may pay by Paypal (3.5% automatically added to the total). The texts of these essential Cho healing rituals have been translated for the first time in the West, and put together in a format that is both practical and beautiful, as befits these extraordinary works of sacred science. 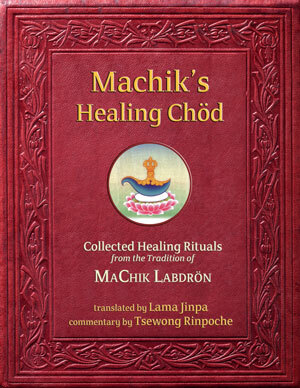 Includes the full Healing Chod ritual translations, which maintains the accuracy and poetry of the original Tibetan text. Transliteration that is uniquely readable and logical to pronounce, while maintaining the syllable structure of the Tibetan words (making learning of Tibetan phrases and jargon far easier). Contains original Tibetan text, for all levels of users, on a separate page from the English translation/transliteration for clarity, easier reference and language study. Includes original instructions (Tibetan version of “footnotes”) of the original text, in a separate appendix.